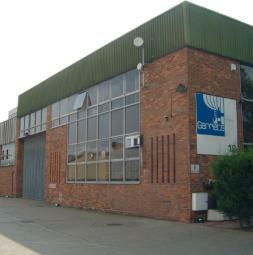 Gerriets is an expanding company with subsidiaries and distributors in 19 countries. Since its founding in 1946, Gerriets has developed into a specialist for stage and event needs. The product portfolio has been continuously expanded and developed for the needs of its customers. It covers all areas: in-house manufacturing of curtains, sheets and scenes, supply of inventory items in excess widths, horizon fabrics, decorative fabrics, stage velvets, effect materials, stage equipment such as train and rail systems as well as regular new product developments. Gerriets has developed into a global specialist for stage needs and event projects. Three generations have shaped the family business Gerriets is today. Every generation has its own business development priorities and contributed to the growth and success of the company with great commitment. 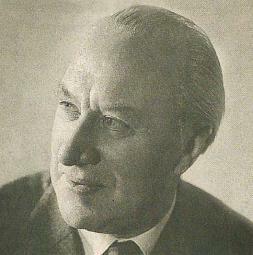 The founder, Hans Gerriets, was the textile producer in the postwar period, his son, Walter Gerriets, was the specialized stage director who promoted internationalization and the grandson, Hannes Gerriets, is the technician of the family, who controls the stage craft in the computer age. Again, Gerriets’ seams are about to burst. The production facility in Volgelsheim has reached its capacity. In 2015, we begin to plan an extension building. 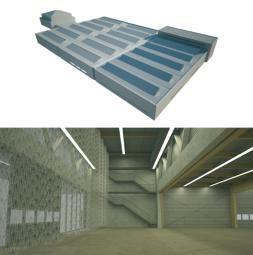 To bring the manufacturing techniques up to date, we need an additional hall with a floor area of 2,000 m². There will be a tower with a total height of 14 meters, to test and alter curtains and projection under stage conditions. 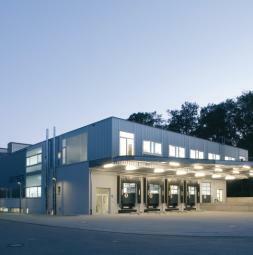 The number of employees at the production facility in Volgelsheim has increased from the original 20 up to 90 employees. The employees are practically working on top of each other in the limited space. The new hall is essential in order to slim the production processes and produce curtains and projection screens effectively again. The planned tower is perfect for hanging projection screens, curtains and special effect materials, that allows for Gerriets to see exactly how the soft-goods will hang and further perfect the curtain. Mega events mark the beginning of the 21st century. Worldwide, the demand for large-scale projects increase. The Gerriets GmbH is on the forefront: Mega events were always at the top of the agenda - MEGA screens, mega curtains and track systems. A specialization in large-scale projects also requires expensive project planning and increased space for the project department. After the renovation of the headquarters in Umkirch the project management moves from Volgelsheim to Umkirch and drives the MEGA business forward. Lack of space is a constant companion in the company’s decades-old history. 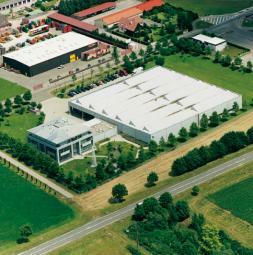 The solution in 2007 is the construction of a new logistics center and high bay warehouse in Umkirch. The most modern logistics software and over 3,500 sqm of new floor space, provide support and effective work processes for the employees. The youngsters join the management and take the helm of their own areas. Hannes Gerriets, the technology enthusiast, will take charge of the technology, research and development areas. His brother in law, the graduate economist Bernd Baumeister, is responsible for the Finance, Controlling, Personnel and Administration of the Gerriets GmbH. Under the leadership of the directors Hannes Gerriets and Bernd Baumeister, the company continue grows and becomes a global player on the market for theater and event management. A tradition from the founding years continues successfully. The Managing Director, the project managers and the employees from all specialties have the eye on the market and are open to all kinds of customer needs. Accordingly, the internal processes are defined: specializing in large projects, development and expansion of the technical areas. Other subsidiaries and distribution partnerships are established worldwide with branches in the UK, Austria, France, Spain, Italy, Greece, Turkey, Korea, Japan, South Africa, Brazil, Netherlands, and the USA. After two years of construction Gerriets expands to a new production facility in Volgelsheim, just across the French border. The total production area for sewing, screen welding and metal workshops comprises 7,500 m². The factory in Volgelsheim starts with a total of 20 employees in three departments: sewing, welding and project department. 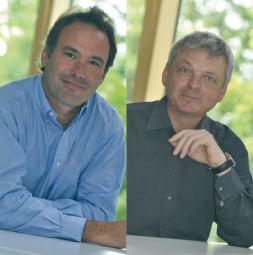 At the same time, the subsidiary SARL moves into the French market. With the demand for extra-wide materials growing all the time. 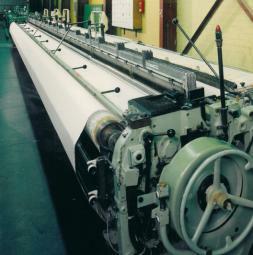 In 1985, Gerriets decides to create their own looms and manufactures fabric with widths up to 12,45 m. These wide width materials allow for seamless curtains and increased efficiency in the workshop. 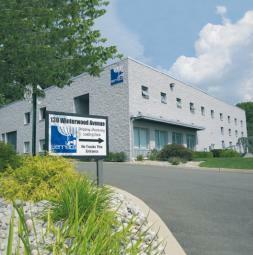 ‘Gerriets International' in Allentown, NJ USA. 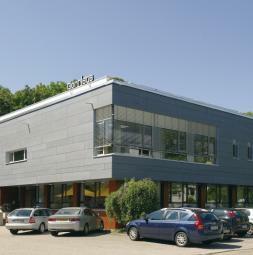 The rapidly growing business of Gerriets is being restricted by the capacity of the Freiburg workshop. Alternative areas of appropriate size are not available in Freiburg. A new location is found in Umkirch near Freiburg. 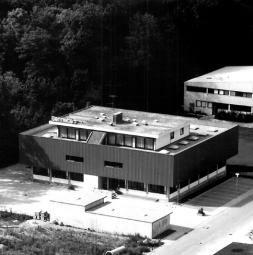 The new headquarters for Gerriets GmbH is built there in 1970. In the mid-sixties, the era of screens begins. At first, Gerriets develops the REVUE screen and the demand for the new screen quickly grows. Gerriets invents a custom screen welding machine to assemble the screens. 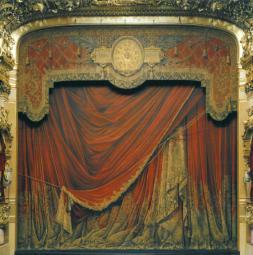 One request for a screen material comes from the one of the famous Paris opera houses. Their requirements lead to the development of the OPERA screen and give the famous screen its name and it is still a popular screen today. 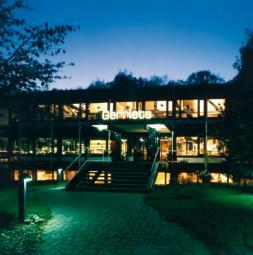 After the death of Hans Gerriets, his wife Johanna and his son Walter become shareholders at the Gerriets GmbH. 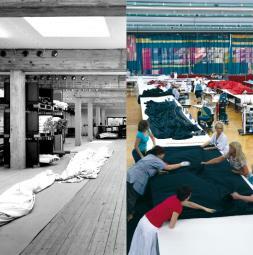 Orders for stage textiles are growing continuously, along with the demand for ready-made curtains. The facilities managers want a complete package, from project conception to installation. 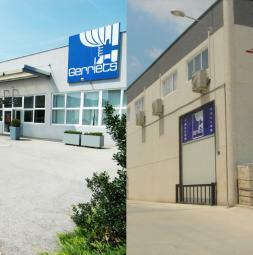 For Gerriets, it is the starting point for further specialization – the production of theatrical equipment. Fabric cutters, seamstresses and installers are hired. 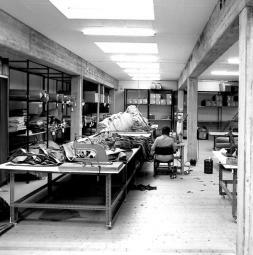 By the end of the fifties the product portfolio consists almost exclusively of flame retardant stage fabrics and plastic films that were used for decorative purposes. By the mid-fifties, culture and theater are once again flourishing in Europe and there is an increased demand for flame reatardant textiles. Walter Gerriets,, the son of the company founder, Hans, travels through the Badische country to introduce the Gerriets Product Portfolio to technical directors and facilities managers. He was known for always carrying a folding ruler under his arm, ready to tackle any project. The period of reconstruction is in full swing. 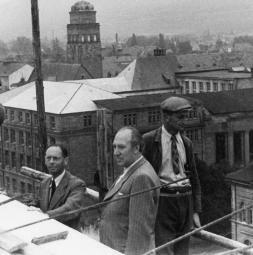 Hans Gerriets is working as a site manager, where he is responsible for the reconstruction of the theater in Freiburg, while growing his textile business. After the war, the demand for all kinds of textiles was particularly high. 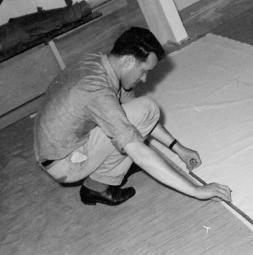 As an experienced textile manufacturer and expert on fabrics, Hans Gerriets founds his textile wholesaler in April of 1946. 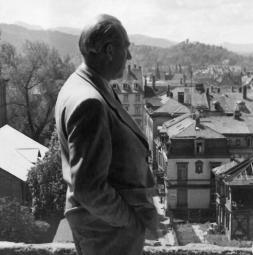 In 1946, Freiburg was in ruins after the war and many necessities were scarce. The demand for textiles was particularly high. Hospitals and clinics were in dire need of clothing and blankets for the upcoming winter. Home textiles were no better. Hans Gerriets seizes the opportunity to become an independent entrepreneur in the textile sector. He had gained his expertise while managing a weaving mill in Riga.